A walk with a guide in the capital of Uzbekistan is an excellent opportunity to learn more of the city that is 2200 years old. Today this biggest city of Central Asia is cultural and economic center of the country. The city combines old residential quarters with narrow streets and business-centers with wide alleys among which there are many historical sights. Besides, Tashkent can boast its bright bazaars, green parks, fountains, and of course, the metro line, that is not only means of transportation, but also a beautiful attraction of the city. Moreover, we recommend you to take not only Tashkent tour, but explore its vicinities as well. There are picturesque Chatkal Mountains in the city surroundings, with turquoise water of Charvak reservoir. Here you can go on a hiking tour to the beautiful mountain gorges, take a boat trip along the lake, enjoy the beauty of Uzbekistan Mountains, have picnic in the nature, and even take a risk going down the Gulkam canyon with insurance support. Tours to Tashkent and its vicinities make your holiday interesting and fascinating! 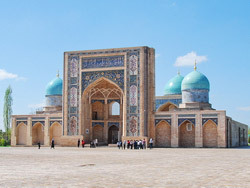 Discover Tashkent in a day long tour. The tour will introduce you ancient part of Tashkent sights in the beginning, and in the end – the modern part of the city. First, you will visit the Old city with its colorful Chor-su bazaar, where the main historical sight , Khast Imom complex, is located. The building consists of mosques and madrasas; and famous for exhibited Koraan of the 7th century. After you will see Tashkent metro. You will enjoy the main squares of the city and roundup the excursion at the Museum of Applied where pieces of arts, archeological findings and national clothing are exhibited. For those who enjoy pleasant countryside holidays, as well as those who like watching the countryside views from the window of the car, there is an opportunity to take a great trip to the beautiful landscapes of the Tashkent surroundings. This one-day trip by car will be a real solution for those who wish to relax from the city hectic life. Two hours trip and you will be at the foot of the Big Chimgan covered in snow even in the springtime. Besides, if the cable car in the touristic base of Beldersay is open on that day, it will be possible to take a cable car up to the top of the Kumbel Mountain, where you will have a breathtaking panorama of the surrounding mountains. 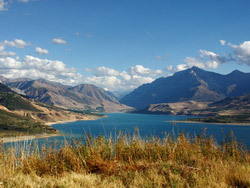 After, you will have a drive along the shores of the Charvak reservoir. The closure of this wonderful trip will be lunch in Khodjikent, where you can also see thousand years old rock carvings of primitive. One-day trekking in Beldersay is a beautiful and moderate level hike in the mountains of Chimgan, where you can have an active rest in the nature. The route stretches for 8km, and gifts different kinds of mountain landscapes on the road: you will see two waterfalls, go up the marble slab with a slight slope where you can discover pre-historic rocked cockle-shells, walk through thick groves, little coniferous forest, alpine meadow, cross the Beldersay river. On your road, you will have two passes where greatest panoramas of mountains will open. In the end of the tour, you will feel tired but so much impressed. Luckily, the next day this tiredness will disappear but the memories of this beautiful hiking tour will remain forever. 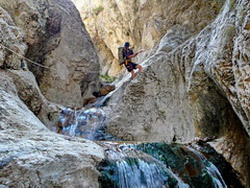 If you really love active holidays, then do not miss a chance to take a tour to the Gulkam canyon. This natural sight is located in the eastern spurs of the Big Chimgan Mountain and is famous for its breathtaking rock gorge where icy waters of the Gulkam River flow. 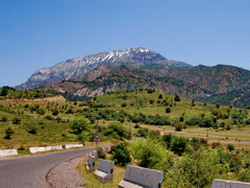 To get there, it is necessary to drive two hours from Tashkent, walk up to the Pesochniy mountain pass where you get great view to the surrounding mountains, and go down to the canyon itself. After you finish the first part of the trekking, you will have a delicious lunch. The second part is the most interesting one: it involves going through the Gulkam canyon with insurance support. The closing part of this fascinating tour will be exiting the canyon along the river flow, and drive back to Tashkent along the shores of the Charvak reservoir.